The cynic would say that the turning point in the Bellevue-Shadle Park football game Saturday afternoon came on the first play when the Highlanders fumbled the kickoff. That would be selling the visiting Wolverines short. No. 1-ranked Bellevue scored seven touchdowns and a field goal in the first half – so it’s not like the Wolverines needed a jump-start. The Highlanders morphed into the team that coach Alan Stanfield watched on film in 11 Bellevue games – an opponent that couldn’t put up any resistance against the Wolverines. The result was a runaway victory for the five-time defending State 3A champion as Bellevue notched a state-record 53rd straight victory, 66-0, in a semifinal mismatch of titanic proportions at Joe Albi Stadium. What the game showed is the Highlanders are an ocean apart from the state’s standard bearer. A blow-by-blow account of what happened isn’t required. Suffice to say that the Wolverines (13-0), including their backups, ran roughshod over the Highlanders (11-2). It did, indeed, start on the opening kickoff. Bellevue recovered the fumble at Shadle’s 22-yard line, and three plays later junior running back Mustafa Branch scored the first of four touchdowns as the game was barely 1 minute, 14 seconds old. On Shadle’s first possession, the Highlanders went for it on fourth-and-3 from their 27 – perhaps an early sign of desperation. Shadle got the first down but ultimately had to punt. Six plays later, Branch scored again. Bellevue added two TDs before quarter’s end. By the end of the half it was 52-0, and that meant the game would be played with a running clock in the final two quarters. Though there was little evidence as to why Saturday. By early in the second quarter, Bellevue was pulling its starters. Still, the Wolverines’ reserves were too much for Shadle. Shadle had a brief moment when it showed some life trailing 21-0. The Highlanders’ best drive took them from their 19 to Bellevue’s 22, where the possession was stopped by an interception. 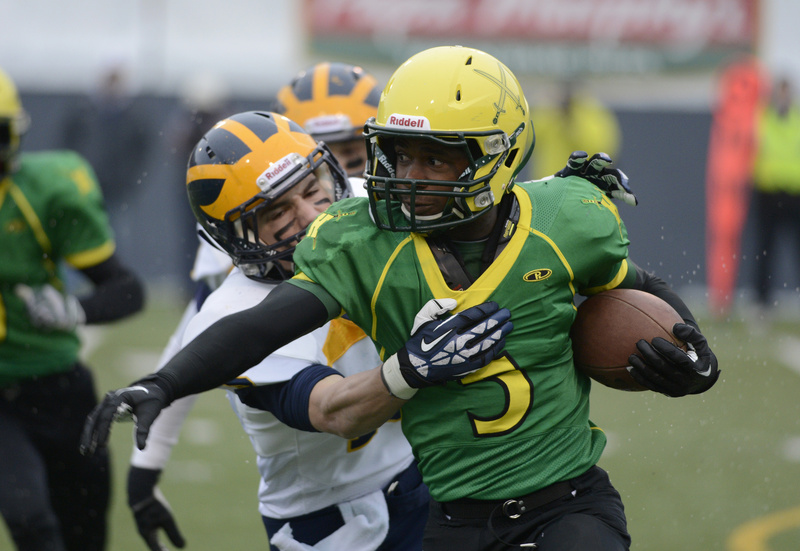 Shadle, playing in its second semifinal since 1991, had four turnovers and two punts blocked in the first half. Stanfield commended his team for fighting the good fight in the face of pending defeat. Rypien completed 22 of 38 attempts for 154 yards. He had two interceptions.